A joint PwC & LeanIX study has been conducted to shed light on the SAP S/4HANA transformation. 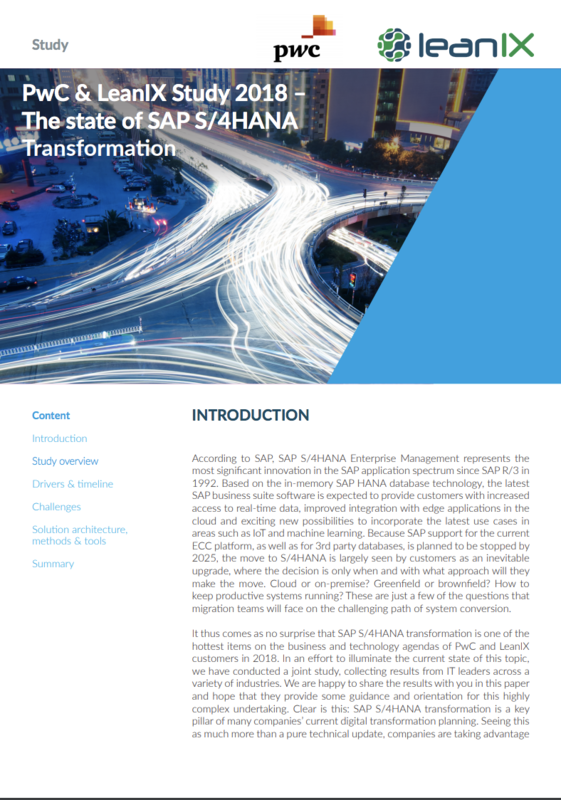 This study provides the reader with guidance and orientation on their S/4HANA transformation process. It's no surprise that SAP S/4HANA transformation is one of the hottest topics on the business and technology agendas of companies these days. The SAP S/4HANA software will provide customers with increased access to real-time data, improved integration with edge applications in the cloud and exciting new possibilities in areas such as IoT and machine learning. Because SAP support for the current platform will stop by 2025, the move to S/4HANA is inevitable. The question now is, when and with what approach will organizations make the move. Cloud or on-premise? Greenfield or brownfield?